Get a real handle on your event favors with these vintage rustic style Perfectly Plain Collection glass mason jars. 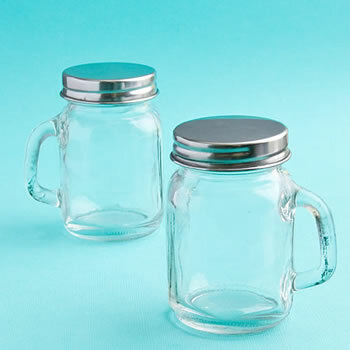 Each four-fluid-ounce-capacity glass jar measures 3.25" tall x 2.5" wide including handle and has a classic mason jar shape with a handle and a removable screw-on round silver metal cap for a tight seal. The top or front of each jar is perfectly fit for the application of the personalized label of your choice. Label not included. Jar favors come bulk packed. this is the perfect party favor for a baby shower. The jars arrived quickly and on time. They are serving my purpose very well! I’m very happy with my order! They were very reasonably priced. The ordering was easy and it was delivered to me nice packed and quick! Product arrived exactly as pictured, on time, and worked out perfectly. I ordered a sample of this product to make sure it was the size I was needing. The product definitely met my expectations! It's sturdy and just the right size for my favors. I will definitely be purchasing for all my wedding guests! Order arrived quickly but one of the jars was broken and another was missing the lid. I ordered extra so I still had enough for my project. These are the size of a double shot glass. Unless you are looking for something so tiny, pass them by. I was ordering these to have plain glasses for my wedding. To complicated to return, so I had to change my whole idea for table scapes. From NicePriceFavors: I'm sorry to hear you were disappointed. For future reference, both the capacity (in ounces) and the size of the item are shown in the description. We used these for kids in Sunday School to fill with mixtures of cocoa with marshmallows, peppermint, or coffee. The kids made them as a Christmas gift for their families. They also attached a gift tag and sprig of garland with a ribbon- perfectly cute! We were very happy to receive the original shipment of the glass mason jars with only 4 needing replaced. You replaced these in a timely fashion. We have been very pleased with your service. Thank you. The jars were delivered quickly! They were all wrapped in bubble wrap. Very cute... Well made! I ordered the mini Mason jars to be the guest gift for my wedding and when they arrived I fell in love with them they were perfect! Not too small and not too big. While going through my order of 100 I found 5 that were broken, I emailed customer service at 11:50am on a Monday and I had a response by 12:10pm the same day and they sent out replacements for them right away! The customer service was phenomenal!! Thank you so much for the awesome party favors! Love this little jar. It's tiny though so it will be great for some events/tasks but way too small for others. I wasn't able to use it for my intended purpose but would definitely order a bunch of them for the right event.